I've been receiving a couple of requests every week about my piece for the "First World Congress for Hallyu" (October 2013) ever since I mentioned it* last year. I might as well post it here. I'd been asked a paper on Hallyu and ethics, and seized the opportunity to raise the alarm on a few abuses, and to call for a better respect of cultural diversity. Clearly, as it is defined and marketed now, Hallyu can't survive long. And it shouldn't without a complete overhaul, because Korean culture as a whole can be hit as collateral damage. There was so much more to say, but I was not going to write a whole book on this topic (well maybe I should, it would most certainly outsell my absurdist fiction). PS: it had to be split into 3 parts to fit this blog's format. See also Part II and Part III. Korea can fulfill its potential as a cultural leader, become a positive role model, and ensure durable success beyond short-lived fads. And because true leaders cannot be respected if they are not respectful, this cannot happen without understanding how wave dynamics work in nature, without a resolute ethical and sustainable approach of the ecosystem at home and abroad, and without embracing cultural diversity. Making more room for smaller players and indie creations, developing fairer revenue sharing models will not only ensure sustainability and benefit all players, but also help raise the nation’s image overseas. When you’re looking for ways to make a wave stronger and more sustainable, the natural place to start is nature itself. Let us not venture into electromagnetic fields today: even if we’re living in a wireless and digital age, sea waves are much more familiar than sound or radio waves, and most people know what they look like, how they feel like. The first lesson nature teaches us, is that all waves are about energy that travels, actual disturbances, so it’s very important to keep in mind that even the most discreet wavelet can have both positive and negative effects, that respect is of the essence. Yes, waves do carry life and beauty, but as recent history reminded us, they can also bring destruction. And if tsunamis remain rare events, aren’t all shores being reshaped every day by simple, recurrent tides? 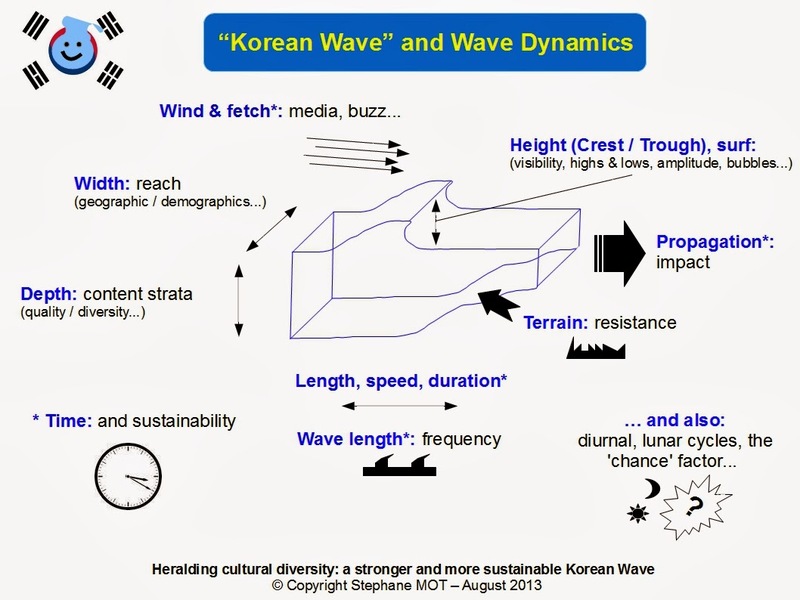 b) Defining Hallyu: a simple wave, a current, or a vast ocean? How do we want Hallyu to be remembered: as a wave, as a current, or as an ocean? As an entertainment fad from the early 2010s essentially targeting younger generations (which can revive later and permeate popular culture, like disco for music, for example), as a special Korean way or flavor for a specific dimension of culture (like Bollywood for cinema, for example), or is Hallyu a generic term to define the whole Korean culture in motion? The third proposition is not only the most ambitious, but also the most sustainable. And even the easiest to grow and maintain. More than a Korean wave that quickly rises and breaks, more than series of waves, people must realize that Korean culture is a vast and deep ocean, that each time they look at it, they only see the surface. A little bit like the tip of an iceberg, except nothing is frozen here. Everything is always moving, moving meaning perpetual movement as well as a wide range of emotions, strong as well as subtle. Waves are projected to help audiences see more of what’s inside, to help them crave for more, want to explore this vast but welcoming ocean by themselves. Waves are not the purpose, but only means, elements of proof, each message revealing one facet of the same ocean. The challenge is to do justice at the same time to Korean culture’s vast diversity, and to its unique character. Of course, no culture can be summed up in a few words: each culture encompasses countless dimensions (e.g. music, literature, language, arts, architecture, games, etiquette, sports, cityscapes, entertainment, tourism, fashion,…), and each dimension encompasses very wide spectrums (e.g. tradition and modernity, mainstream and underground, popular and elitist, slow and “bballi-bballi”, beautiful and ugly, made in Korea or overseas, made by Koreans, non-Koreans, mixed citizens…). And of course, no culture can be summed up in terms of products or marketing, no ocean can be branded. But somehow, you need to feed an umbrella brand, to highlight content verticals, and you can’t pretend to go far, let alone start any relevant campaign, without a clear and consistent strategic vision. Diversity being a perquisite for all cultures, differenciating requires specific characters that makes this Korean ocean Korean. Is that “Jeong”? is that “Intensity”? Anyway that’s something as universal, timeless and far reaching as an ocean, not just some “segmenting” speciality which only will have a limited reach in terms of audience, time, or diversity, like K-pop (a wave, like disco) or K-drama (a current, like telenovela). But you don’t need to word these “characters” out: that’s neither branding, nor a slogan you dump after a few campaigns, and what matters is that the audience knows which ocean you’re talking about. Again, the aim is not to design each time the perfect wave, but to reveal an ocean’s potential, from different angles. You can’t paint an ocean in motion by nailing reality at each stroke, and you feel much more comfortable when you keep the big picture in mind. The public doesn’t need to see everything, just to know that there is a lot to see, to crave for discovering more by themselves.